The USNC/TAM has initiated a new series of periodic reports, Recent Trends in Mechanics. The new reports are typically spearheaded by one of the Committee members, working with other experts in the subject, but proposals from interested researchers are also encouraged. Focused topical reports or review articles publishable in archival or trade journals on specific areas identifying current and future trends on a topic in mechanics. In either case, the report will be distributed by the USNC/TAM in print and electronically. Applications-related reports that highlight the importance of various areas of mechanics to critical national needs in science and technology. Examples could include "U.S. energy needs and critical contributions from mechanics research" or "U.S. environmental issues and technical contributions in mechanics." The intent is that these reports contain high level information that is of use to and helps to influence policy makers when national research priorities are under consideration. These reports would also contain detailed discussions that would be of interest to the research community. It is expected that these reports will be prepared in cooperation with a number of colleagues in academia, government laboratories, and industry. Web-based reports, blogs, discussion groups, etc., that take advantage of internet based tools. These could follow formats of various blogs; they could emulate the successful model of http://www.iMechanica.org and provide a continuous forum for discussion of research trends. This requires ‘Moderators’ who are willing to engage in such continuous discussions. In addition to discussion groups, these could also become repositories of commentaries, archives for mechanics success stories, and general sources for the promotion of mechanics. The decision of the USNC/TAM will be communicated by May 31 of each year; one member of the USNC/TAM will be added as coordinator/co-author of the report. Selected authors will be required to submit the completed report within six months (November 30). The report will then be reviewed by the USNC/TAM prior to approval and publication. Sub-Committee on Reports for 2014-2015: K. Ravi-Chandar, Chair (ravi@utexas.edu), G. McKinley, Vice-Chair (gareth@mit.edu), A. Karagozian (ark@seas.ucla.edu) and Roger Ghanem (ghanem@usc.edu). Biological fluid dynamics is arguably one of the most active, visible, and exciting areas of fluid dynamics research today, with studies in areas ranging from the human cardiovascular system to marine animal propulsion. 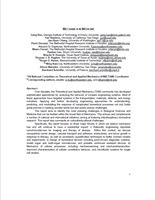 The aim of this article is to summarize emerging trends in biological fluid dynamics, and to identify core areas of interest, and future directions at the intersection of fluid dynamics and other, adjacent fields such as biology and medicine that are of critical technical and societal importance. On September 15 - 16, 2014, the Workshop on Fluid Dynamics of Living Systems was held in Arlington, Virginia, with NSF support. Contributors to this article were selected among the invited speakers to the workshop. 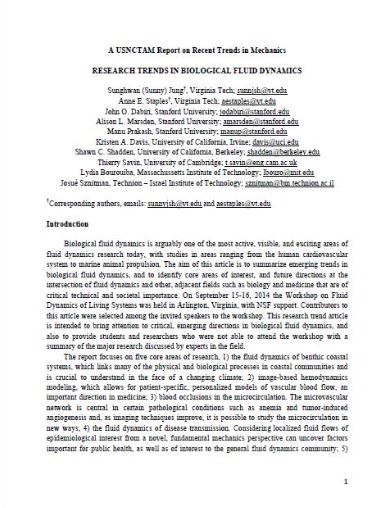 This research trend article is intended to bring attention to critical, emerging directions in biological fluid dynamics, and also to provide students and researchers who were not able to attend the workshop with a summary of the major research discussed by experts in the field. Granular materials are complex systems that are receiving intense interest within the engineering, physics, and mathematics communities. These ubiquitous materials play a significant role in geosystems, mining, petroleum storage and extraction, ceramics engineering, and pharmaceutical science. 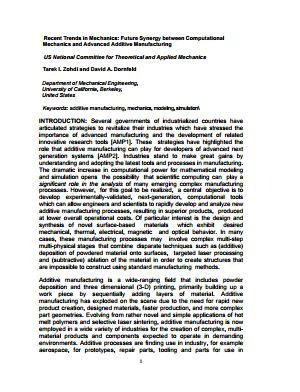 The report reviews recent developments and new advances in experimental, computational, and modeling methods that extend understanding to a wide range of materials and phenomena: multi-phase systems with strong solid-fluid interactions; multi-field systems in which van der Waals and electrical fields gain dominance; and bonded granular systems for advanced pavements. Experimental advances include computed neutron and nanometer scale tomography, magnetic resonance imaging, refractive index matching, digital image correlation, and acoustic emission analysis. Complex systems and data mining tools are now being used to extract meaningful information and patterns from data. 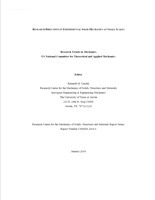 The state of the art in continuum modeling has shifted to micromechanical or multi-scale approaches with developments being made from three perspectives: constitutive modeling enhanced by material fabric and fabric evolution; modeling discrete systems as equivalent continua; and computational multi-scale modeling. Advances in computational modeling and parallel computing are exploited to model the complexities of grains and contacts, and to study strongly coupled grain-fluid systems using computational fluid dynamics and particle-structure interactions using combined discrete and finite element methods. This report focuses on three broad advances in granular mechanics: the experimental imaging of granular materials (Part I); the transition between micro-, meso-, and continuum-scale modeling (Part II); and the modeling of multi-phase materials (Part III). Several governments of industrialized countries have articulated strategies to revitalize their industries which have stressed the importance of advanced manufacturing and the development of related innovative research tools. These strategies have highlighted the role that additive manufacturing can play for developers of advanced next generation systems. Industries stand to make great gains by understanding and adopting the latest tools and processes in manufacturing. The dramatic increase in computational power for mathematical modeling and simulation opens the possibility that scientific computing can play a significant role in the analysis of many emerging complex manufacturing processes. However, for this goal to be realized, a central objective is to develop experimentally-validated, next-generation, computational tools which can allow engineers and scientists to rapidly develop and analyze new additive manufacturing processes, resulting in superior products, produced at lower overall operational costs. Of particular interest is the design and synthesis of novel surface-based materials which exhibit desired mechanical, thermal, electrical, magnetic and optical behavior. In many cases, these manufacturing processes may involve complex multi-step multi-physical stages that combine disparate techniques such as (additive) deposition of powdered material onto surfaces, targeted laser processing and (subtractive) ablation of the material in order to create structures that are impossible to construct using standard manufacturing methods. 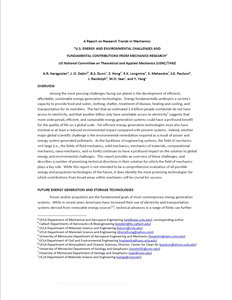 The present report highlights some of the key issues in modeling these processes and discusses the potential synergy between emerging additive manufacturing processes and next-generation mechanics-based modeling and simulation techniques, as well as future research directions. The full June 2015 report can be downloaded here. This report aims to identify the most pressing challenges in Biological Sciences and Medicine that can be tackled within the broad field of Mechanics. This echoes and complements a number of national and international initiatives aiming at fostering interdisciplinary biomedical research. This report also comments on cultural/educational challenges. The full 46-page report can be downloaded here. In addition, this report is also available online through Interface, a journal of the British Royal Society, and the U.S. National Library of Medicine at the National Institutes of Health. The goal of this report is to identify major research topics in this area that are likely to be the focus of enquiry for the next decade. Since these topics will invariably spur the development of new tools, some attention will also be directed towards current trends in this arena. This report gathers the input of a number of leaders in topics of interest and the development of new tools. The full 26-page report can be downloaded here. As the backbone of engineering systems, the field of mechanics writ large (i.e., the fields of fluid mechanics, solid mechanics, mechanics of materials, computational mechanics, nano-mechanics, and so forth) continues to have a profound impact on the solution to global energy and environmental challenges. This report provides an overview of these challenges, and describes a number of promising technical directions in their solution for which the field of mechanics plays a key role. While this report is not intended to be a comprehensive evaluation of all possible energy and propulsion technologies of the future, it does identify the most promising technologies for which contributions from broad areas within mechanics will be crucial for success. The full 18-page report can be downloaded here. Since 1991, the USNC/TAM has had six other reports produced that survey the field of mechanics, with particular emphasis on identifying areas of mechanics for future research. The committee asks individuals, or groups of individuals to write the reports. The recent reports are short, overview documents, intended for a wide audience, including policymakers. The first three reports are intended for specialists and provide a contextual background on specific research areas and point to new opportunities, needs, and trends. Research Directions in Computational Mechanics (1991), J.T. Oden (Ed. ), published by National Academy Press, was the first of the research directions reports. Computational mechanics is a scientific discipline that marries physics, computers, and mathematics to emulate natural physical phenomena. It is a technology that allows scientists to study and predict the performance of various products--important for research and development in the industrialized world. This book describes current trends and future research directions in computational mechanics in areas where gaps exist in current knowledge and where major advances are crucial to continued technological developments in the United States. Read the book online for free or purchase a copy at the NAP website. This material is based upon work supported by the National Science Foundation under Grant Number CMMI-1338717. Any opinions, findings, and conclusions or recommendations expressed in this material are those of the author(s) and do not necessarily reflect the views of the National Science Foundation.